One of the earliest books I had that discussed comics in anything resembling a historical context was The Encyclopedia of Collectibles, Children's Books to Comics. It was part of a Time-Life series from the late 1970s; I've seen a couple other volumes but this was the only one that held any interest for me. It only had 13 pages devoted to comics, and most of those were filled with imagery, but it was still the only thing I had back in the day that looked at comics comprehensively, talking about them as a medium specifically and noting both comic strips and comic books in equal measure. It was, for a long time, the most significant source I had about comic strips. I came to learn of other, more detailed books' existences, but my interest back then was in comic books, particularly superheroes, particularly Marvel, particularly the Fantastic Four. I put my resources towards learning about those in order of narrowest interest to widest, so I didn't really start looking at comic strips with a serious eye until I was well into my 20s, if not early 30s. 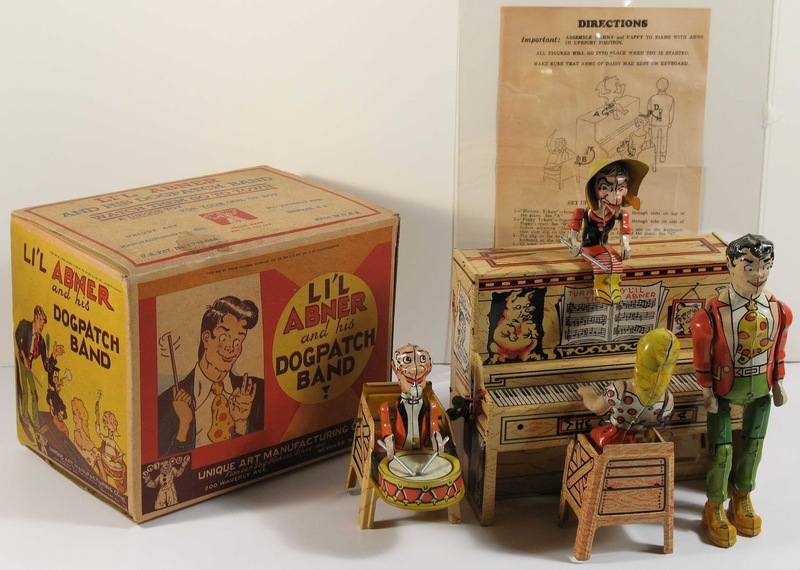 But one piece from The Encyclopedia that stood out for me was a photo of "Al Capp's Dogpatch Band" in the sidebar on toys based on comic properties. The gadget was a wind-up toy from the mid-1940s featuring characters from Capp's strip, Li'l Abner. The image struck me for two reasons. First, I had never actually seen Li'l Abner anywhere before. It wasn't carried in our local newspapers at the time, and the book didn't show any instances of the strip itself anywhere. I was largely at a loss for what the strip was about. While I was familiar with the Shmoo via some Saturday morning cartoons, that had almost no relation to the strip where the character originated. The second thing that stood out for me was the complexity of the mechanics. Even though I only had a still picture to look at, it wasn't hard to figure out what the basic movements of the figures were. I realized, even as a kid, that the engineering to tie all of that movement to a single gear was an impressive feat. It was only recently (last night, actually) that it occurred to me that someone might have posted a video of the toy in action, and I could finally see how it operated. It turned out to be even more impressive than I imagined, with some clever use of deliberately loose joints to facilitate even more movement. And seeing (in the above photo) that it came partially disassembled makes it even more impressive still! I can't find out who designed this, but it's a brilliant piece of mechanical engineering and I can't imagine Capp not being absolutely delighted with it!